Saturday April 20th is April Pool's Day at The Covington Aquatic Center, free lessons, water safety games and activities from 1 - 2 pm and Public Swim from 2 -3 pm. 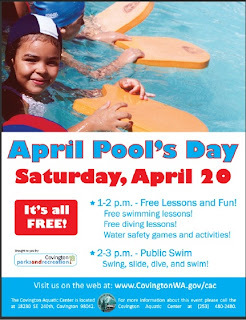 Go just to swim or if you were thinking about lessons for your child but weren't sure if they would enjoy it, this is a great chance to let them check it out for free. Our Daughter has done 5 swimming classes at The Covington Aquatic Center, she loves it, she has enjoyed all of her instructors and has really improved over the last 2 years. For more details go to www.covingtonwa.gov/cac/. Maybe we'll see you there!